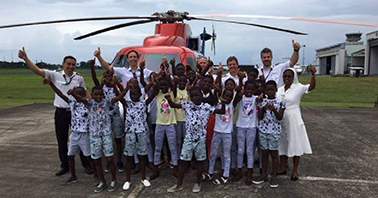 Earlier this fall, the team at our Malabo base in Equatorial Guinea invited children from The Orphanage of Our Lady of the Almudena to join them for a special Kids Flight event at the base. This special event gave 20 children and their teachers the chance to build on their last visit to our facility and experience their own helicopter ride for the first time. This effort was led by Captain Louis Venter and was made possible by the combined effort of the entire base team. The group was split between two flights and went through a full safety briefing and then refreshments and even singing in the lunchroom after their trip. They were all extremely excited to be part of this event and had huge smiles throughout the day. The base team prepared a short video with clips and images from throughout the event, which you can watch here. The Malabo team continues to provide ongoing support to The Orphanage of Our Lady of the Almudena. To date, the team has raised approximately $7,000 USD. To learn more about what the team is doing or how to contribute to help them make a difference, visit https://www.angelwingsmalabo.com/.